Floors made of ceramic tiles are suitable for practically any type of room. They are perfect for high-traffic areas such as corridor, kitchen, bathroom or living room. Tiled walls, in turn, are an impressive decoration of the kitchen or bathroom. However, it is important what tiles you choose for a specific place and what will be their parameters. Here are some tips to help you choose the right type of tiles and get to know their parameters. Choosing tiles for walls is primarily a matter of taste. In such a place, the technical parameters are not as important as on the floor. More important is the size of tiles, their colour and design. Tiles on the walls create interesting surfaces, they can be arranged by composing a few different colours and patterns. If you are looking for an idea for an original decorative wall, it is worth to take advantage of the collections offered by manufacturers, that include basic tiles and matching wall decorations such as inserts and narrow strips. This solution is recommended for both small and large rooms. Most collections are available as combinations of calm uniform basic tiles and matching decorations such as very ornamental glass inserts of the same size. Ermeo / Ermo collection, Ceramika Paradyż. It is a kind of cladding that looks very impressive. It subtly shines, beautifully decorates and, what is very important, is perfectly suited for finishing shelves, niches, various closets, of which there is never too many in small interiors. Mosaic can also be used in spacious bathing salons – it is perfect for separating zones, laying decorative strips or finishing rounded surfaces. Mosaic is a perfect finishing for rounded or small surfaces. Each tile’s size is usually between 2×2 and 4×4 cm, but to make laying more convenient, they are connected on a grid of about 30 × 30 cm. Altea / Albir tiles collection, Ceramika Paradyż. They are currently the most popular type of tiles. The 60×60 cm or 75×75 cm formats are chosen for walls more and more often. Such tiles create calm uniform surfaces, especially when they are arranged almost jointless (you can learn more about the topic in this article). They are most often available in subdued colours and motifs imitating wood, stone or concrete, so they are a great alternative for enthusiasts of these materials. Large tiles look better in spacious interiors – when we look at them from a distance, the joints become even less visible, and thus the effect is more perfect. In small kitchens or bathrooms, you have to make sure that the wall is not too small for large formats (avoid the situation when there will be one large tile and only one narrow strip of another one). 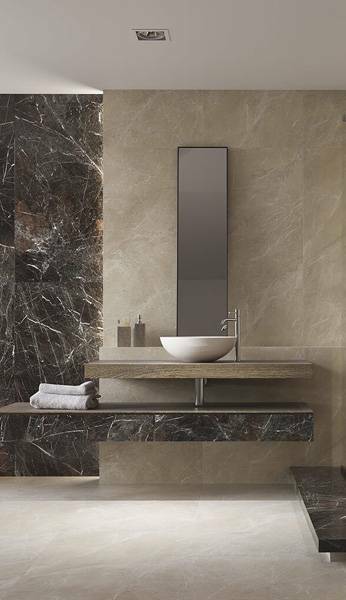 Large tiles with subdued colours fit minimalistic bathrooms perfectly. Norway Sky special collection, Ceramika Paradyż. Especially important here is not only the design of tiles but also their parameters and technical characteristics. A resilient floor is a basis for designing interiors in which you can feel comfortable. So, what is most important when choosing ceramic tiles for the floor, what to pay attention first? Determined with PEI symbol. It is a measure of the resistance of glazed tiles to surface abrasion – the greater the PEI, the higher the abrasion resistance class. PEI 3/750 tiles can be successfully used in a living room, but for high-traffic areas, such as the hall (you can find more information on it here) or the kitchen it is better to choose those with a higher resistance, e.g. PEI 3/1500 or 4/6000. Glazed tiles are currently the most popular floor cladding for all indoor and outdoor applications, offering very good performance characteristics, such as: low absorbability, high resistance to bending, high hardness and abrasion resistance. They can come in various surface types: matte, semi-polished and lappato (a kind of polished glaze). Glazing allows for achieving a variety of visual effects and applying all kinds of graphics on the tile’s surface. 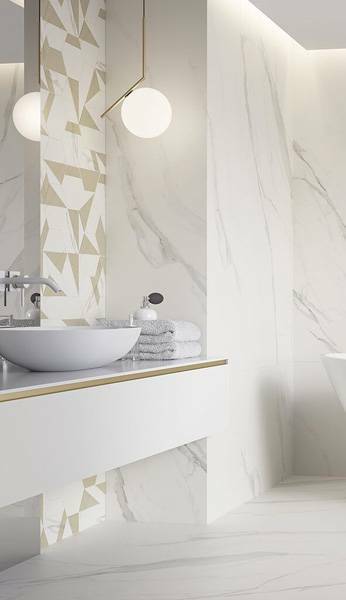 Tile surfaces differ not only in type and colour but above all in technical parameters. Tecniq collection, Ceramika Paradyż. Skipping the glazing stage allows for obtaining unglazed tiles with surfaces that are very resistant to mechanical factors. 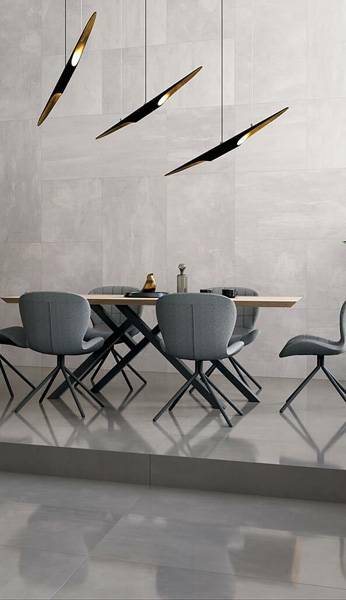 This type of tiles is therefore intended mainly for investment applications, although due to the influence of modern interior trends, they are more and more frequently used in living quarters. Unglazed tiles come in three types of surface: matte, polished and structural. Both types of tiles can be used in the living room, kitchen and bathroom. Unglazed tiles are recommended for high-traffic areas, due to their very resistant to mechanical factors surface – they do not crack when something heavy falls on them, they are not affected by chemicals, they are abrasion-resistant. It is a parameter that affects your safety. Therefore, when selecting tiles for places like bathrooms, you should pay special attention to it. The symbols R9-R13 are used to indicate the level of anti-slip properties of tiles. The higher the value, the less slippery the tile. Lensitile floor tiles with an anti-slip parameter of R10 are perfect for e.g. a hall with an entrance directly from the outside. Lensitile ceramic tiles collection, Ceramika Paradyż. This is an important parameter, especially in the case of tiles purchased for laying outdoor – it is a necessary feature for cladding on terraces, balconies, stairs. It is also a good idea to choose such tiles for the hall or cellar rooms – they are more resistant to moisture and water. Edges of such tiles are cut at a right angle. It is a good idea to choose them if you want to have the smallest possible joints between tiles. A good tile-layer can lay them using joints only 2 mm wide. Tiles form the Sand collection are frost-resistant, rectified and have an R10 level of anti-slip properties. Sand collection, Ceramika Paradyż. Shades of tiles from the same collection may be slightly different. Currently, glazed tiles available at the Paradyż company come in a maximum of five shades – base tile-model, two lighter and two darker versions. On the packaging of the base shade, there is an information “model” or a WZ symbol. Lighter tiles are marked as A1 or A2, darker – as B1 or B2. In the case of clinker tiles and unglazed porcellanato gres, the number of shades is not limited. Each production batch is characterised by a different colouring identified by an alphanumeric code – starting with the letter A and numbers 1 to 99. Due to the fact that the tiles are produced in different shades, the tiles on the store display may differ from those in warehouses. Therefore, when buying them, always pay attention to the shade markings on the packaging. Pay special attention to the shade symbol on the packaging and select tiles with the same mark. Flash tiles collection, Ceramika Paradyż. They are characterised by visible differences in graphics and tile colour hue. It is deliberate – it is not a flaw of tiles. 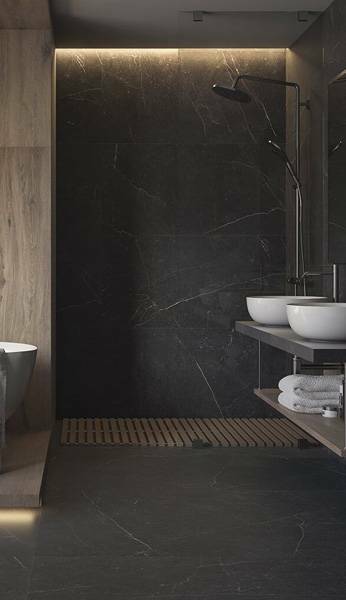 For example: a non-glazed gres produced in the double density technology has a unique pattern on individual tiles. In this case, before laying the tiles, it is best to spread them and mix the tiles from different packages. Tiles of this type include e.g. the tiles from Doblo, Arkesia and Mistral collections. Tonal tiles form a very interesting but slightly differentiated surface because of their tonal colouring. Doblo collection, Ceramika Paradyż. More inspirations can be found at www.paradyz.com.